Wolfe Face Art & FX is a make-up design company best known for its unique products and cutting-edge make-up application techniques. 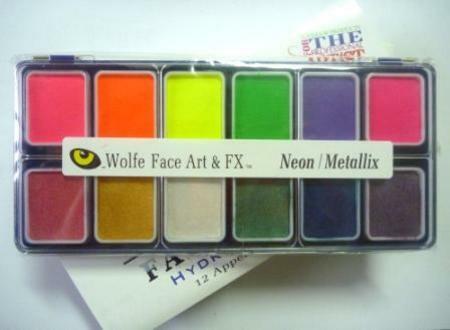 Wolfe has truly revolutionized the industry by combining traditional theatre make-up and fast-paced face painting into a totally new type of face and body art.The Metallix/Neon Appetizer palette is great if you're looking for a basic set which immediately gives you a range of both the neon and metallix colours in twelve smaller sizes. All of the appetizer palettes hold the same sizes of make-up, so they can be removed when empty and easily replaced. The palettes also include one nr. 2 professional brush.